FREE COUNTRY is the second in a series of spy thrillers by Jeremy Duns. This novel is set in May 1969, at a time of political turbulence throughout Europe. The anti-hero, Paul Dark, is a senior MI6 double agent who has passed information to Moscow since the forties. At the opening of FREE COUNTRY, Dark has narrowly escaped being unmasked as a Red plant during the events of the previous novel, FREE AGENT, and is recovering from a nasty tropical disease contracted in Africa during his previous adventure. To fully cover his tracks, he has had to kill his boss and old family friend, Colin Templeton to prevent being uncovered. Whilst Dark is giving the eulogy at Templeton's memorial service at St Paul's, an Italian sniper tries to shoot him but instead kills temporary head of service, Faraday. When Dark's Russian handlers become mysteriously unavailable, he starts to panic, wondering if Moscow has ordered his assassination. Although keen to remain in London and try and steer the investigation away from his role in Templeton's murder, Dark is unwillingly sent to Rome to look into the Italian connection to Faraday's death, as a Russian backed guerilla art group, Arte com Terrore may have been responsible. On his way to Rome, Dark dodges the Russian agents that try to contact him, believing them to be agents of either the GRU or KGB making another attempt to kill him, and once he is in Rome, Dark has to evade discovery as a double by head of Station and former schoolmate Severn. Dark finds it even harder than he predicted to avoid falling foul of the various intelligence agencies he is in contact with, as now he not only has the British and Russians to contend with but also Italian Military Intelligence. Eventually Dark realises that he is not the only spy with his own agenda, and that he may have stumbled into an even bigger conspiracy than his own treachery. Jeremy Duns takes the theme of betrayal from within, and the shadow of the betrayals of the Cambridge Ring upon MI6, and builds on it to give interesting plot twists going beyond the traditional Cold War rivalries, to show the political and moral complexities within the democratic Western countries. The author manages to keep our sympathies by and large with Dark, no mean achievement given that we know Dark is a liar, traitor and murderer, prepared to kill even an old friend to save himself. 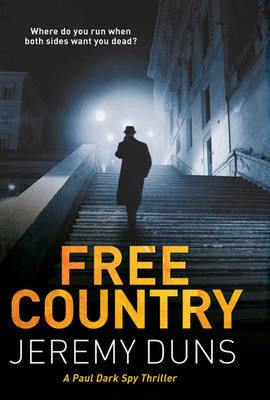 FREE COUNTRY is a well written, intriguing spy thriller, combining the cerebral aspects of the tortuous tangled web of loyalties, espionage and counter espionage, with aspects of an action thriller, featuring some corking chase scenes in the Vatican and Turin. Read another review of FREE COUNTRY (APA SONG OF TREASON).